Raynil Dralas is a Dunmer nightblade posing as a vampire hunter. He recently killed Bradon Lirrian in Bruma, and made it look like he was a vampire. In theory, he is staying at Olav's Tap and Tack, although he is never found there. He will eventually hide out in Boreal Stone Cave as you progress the related quest. 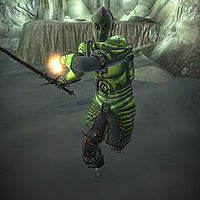 He wears a leveled suit of light armor, up to glass quality and wields a leveled weapon, either a long blade or a claymore, up to Daedric quality. He also carries tan linens, a russet felt outfit and russet felt shoes, a leveled amount of gold and the three keys needed to open the Waterlogged Chest: Raynil's Key, Gelebourne's Key and Bradon's Key. He is able to cast set leveled spells: 3 Destruction, 1 Alteration (Shield, Fire Shield, Frost Shield, Shock Shield or Burden), 1 Conjuration (Bound Armor or Summon), and 1 Restoration (Restore Health, Absorb Health, Absorb Skill or Absorb Fatigue). Upon your arrival, he will walk up to you and engage in conversation: "Congratulations. I had a feeling you would catch on sooner or later. Leaving that journal behind was a stupid mistake on my part. I saw you enter Olav's Tap and Tack before I could get there, and I knew that I had to sneak out of Bruma somehow. It was only a matter of time before you or Carius figured it out. No matter. After I've killed you, I won't need my vampire hunter ruse any longer." Attempting to convince him to go with you back to Bruma, he'll refuse: "Certainly not. I'm surprised Carius didn't send the entire city watch up here. But then I would have seen that coming I suppose. I expected to lay low here for a while and then be on my way. So again, I underestimated you. This leaves me with little choice. Either I fight you now, and have a chance at freedom, or I surrender and rot in a city dungeon. I prefer the chance for freedom." When you offer him one last chance he will refuse again: "Yes, I suppose it is. Well, then, we've talked enough. Only one of us will walk out of here alive this day. Good luck."